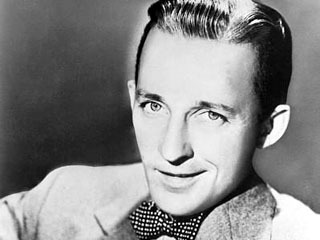 A stirrer of the imagination, a soother of souls, a gentle and loyal companion, Bing Crosby is a crooner for all-time, a superstar of the twentieth century. Known for his songs "White Christmas," "Surrender Dear," and "Sweet Leilani," the baritone was called "the most admired man alive" by Yank magazine. From 1935-'43, Crosby appeared regularly on Kraft Music Hall. He also made many appearances on Command Performance and Philco Radio Time. These performances, in addition to showcasing his now-legendary vocal skills, allowed him to work with the biggest names of the day, including Peggy Lee, Boris Karloff, Al Jolson, Groucho Marx, and Fred Astaire. The story has it that his nickname Bing (he was born Harry) came from his infatuation with the comic strip Bingville Bugle.